With many politicians denying the reality of climate change, it would seem that national discourse is stuck in the past. However, even policymakers and scientists in the 1960s recognized the serious threat posed by climate change. November 5th 2015 marks the 50th anniversary of Restoring the Quality of our Environment, a report published by President Lyndon Baines Johnson’s science advisory committee. In the report, top scientists warned President Johnson of the potentially dire consequences of climate change and global pollution. The report’s introduction explains that “pollutants have altered on a global scale the carbon dioxide content of the air and the lead concentrations in ocean waters and human populations.” It correctly predicted that within a few years, scientists would have created accurate climate models that could identify global surface temperature changes. In 1974, Wallace Broecker, one of the 1965 report’s co-authors, published a paper entitled Climatic Change: Are We on the Brink of a Pronounced Global Warming?, in which Broecker lays out an early temperature change model. As seen above, this model is quite accurate. The 1965 report eloquently describes why fossil fuel use may prove so impactful on the planet: “Within a few short centuries, we are returning to the air a significant part of the carbon that was slowly extracted by plants and buried in the sediments during half a billion years.” The report concludes “with fair assurance that at the present time, fossil fuels are the only source of CO2 being added to the ocean-atmosphere-biosphere system.” Although the report’s authors did not account for the effects of other greenhouse gases, they were correct in noting that global warming is indeed caused by increasing atmospheric concentration of carbon dioxide. The authors also comprehensively warn of the potential consequences of global warming, such as ice cap melting, sea level rise, and ocean acidification. 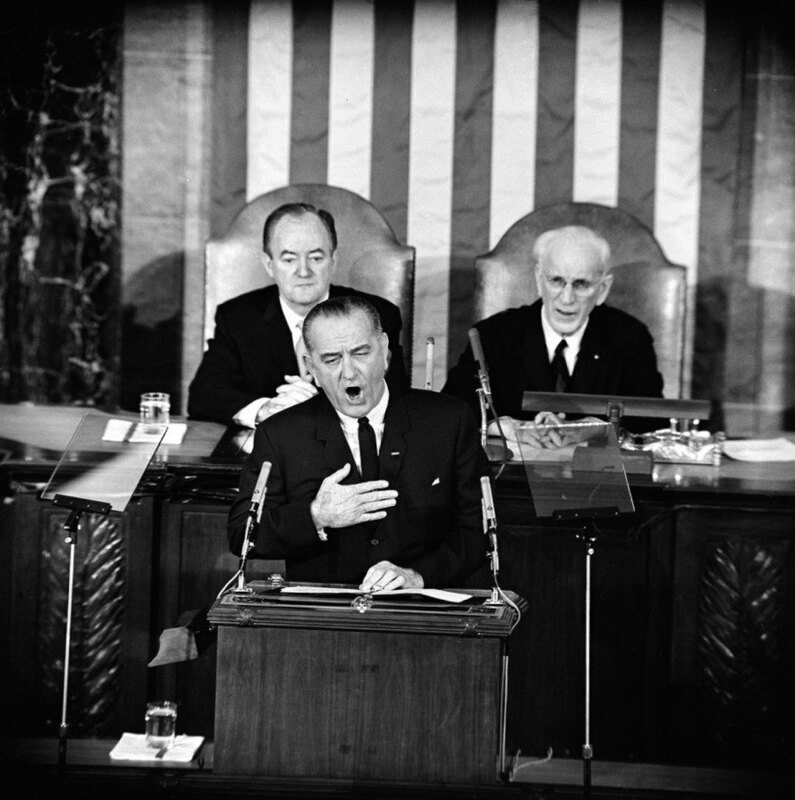 The 1965 report only further confirmed the threat of which President Johnson had warned the nation in a special address to Congress on February 8 1965. “Air pollution is no longer confined to isolated places,” said Johnson shortly after winning re-election. “This generation has altered the composition of the atmosphere on a global scale through radioactive materials and a steady increase in carbon dioxide from the burning of fossil fuels.” Despite the decades of words from politicians and warnings from scientists, the United States is still slow to forcefully confront climate change. 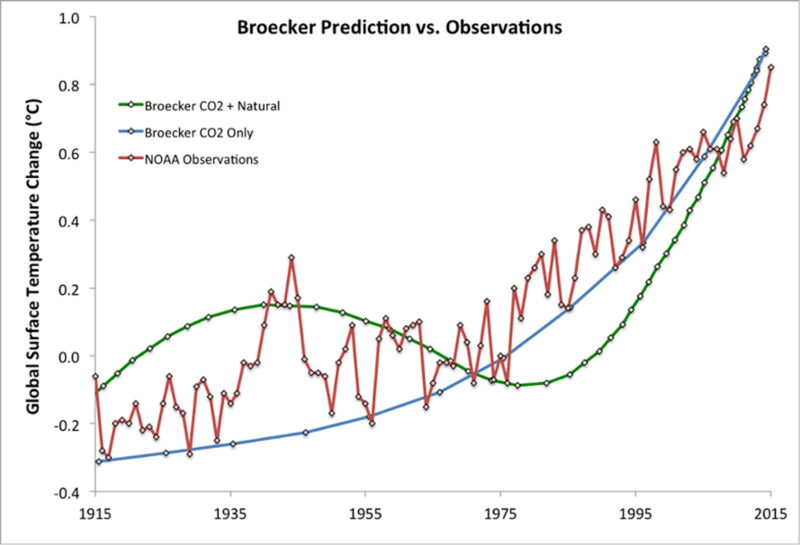 Wallace Broecker’s 1974 climate model global warming predictions vs NOAA observations.